The PS4 is one of the best consoles out there, packed with exclusive games that rock you to your core, as well as those that are available across all platforms. Whether you enjoy the rush felt playing multiplayer on Call of Duty, or you are more prone to the kind of storytelling found in God of War, there is something that every PS4 player should have ready at all times. Having a headset to hand means that you can plug in and listen to the soundtrack for the game privately, but also means that you get to chat with your friends without the entire house hearing what they are saying. It also gives you the option to yell at your teammates when they keep dying, but that’s another story. Even if you don’t have £200 to spend on the newest models, you can buy quality headsets for a budget price, and that’s what we are here to help you with. It’s not always easy to know which headset to pick, or which is going to be right for you, but we are here to give you a hand with things. In order to help you find the best PS4 headset under £50, we have put this guide together, compiling all of the relevant PS4 headsets under £50 reviews in one place, allowing you to find the best possible ones for your next match. What is a PS4 Headset? 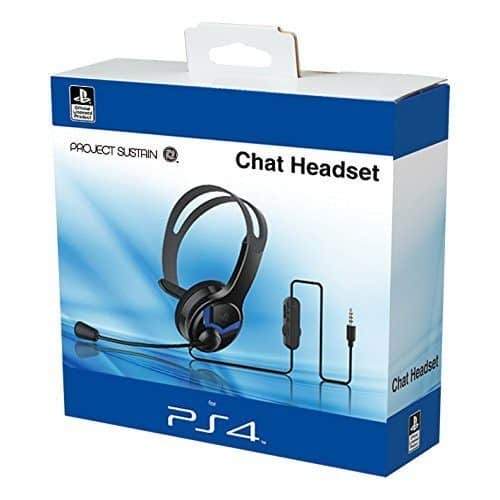 A PS4 headset is one that only works with the PlayStation 4, and it not usually compatible with other consoles or devices – although there are some that work with multiple platforms. The majority of the time, they also have a retractable microphone installed for easy chatting. They can be wired or wireless, with the latter being the more expensive of the two. They hook up to your console quite easily as well. If you are using a wired connection, it usually plugs into your controller’s headphone jack so that you don’t need to try and stretch away from the TV. Wireless ones are often connected using Bluetooth, and they also have a good reach most of the time. You will be hard-pressed to find budget headsets that are wireless, but there are a few good ones out there for you. Now that you know a little more about how they work, check out the PS4 headset under £50 reviews below and see what you think. Wireless headsets are hard to come by at a budget price, especially those that come from good brands. This could be the ideal model for you, and might make your video games that much more enjoyable. It’s worth checking out the reviews below and seeing if this will be the one for you. 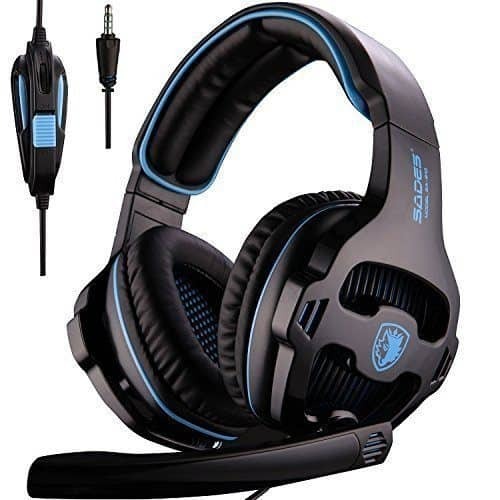 This PS4 headset comes in black with some blue detailing, and the overall design is both modern and stylish with broad compatibility across all platforms – so you can use it for PC gaming as well. The earmuffs are closed, ensuring that outside noise is cancelled out effectively when you are in the zone. They also provide a comfortable fit to prevent soreness after a few hours spent gaming. The headband is also padded so that it doesn’t scrape on your head, and there is even a retractable microphone so that you can chat with your friends easily. The 40mm drivers are incredibly high quality as well, so you get to hear everything that is going on around you – from a fresh explosion to the cry of a monster running up behind you. Plus, it connects up to the PS4 effortlessly for a quick start. The instructions are written in poorly translated English, which some customers found confusing. This PS4 headset comes at a really good and affordable price, so it should fit in comfortably with practically any budget out there. While the instructions don’t have the best English or clarity, you shouldn’t really need them to get started as the headset is basically a plug and play. The sound quality is amazing, the controls are on the side for easy access, and the mic can be moved around as you need it, making chatting with your friends a much easier process. Overall, it makes for one of the best budget headsets we found. If you want to go down the official route, then this headset from Sony is the one you want. As the manufacturers of the PS4, Sony has a good range of headsets that can fit most budgets while still providing a great experience. All you need to do it read below and see if they are right for you. 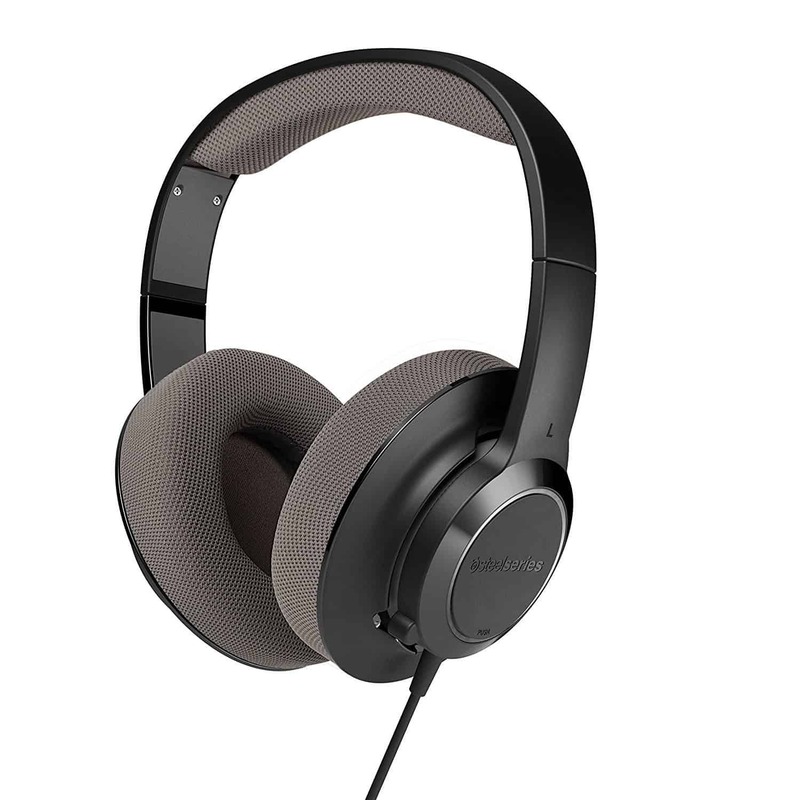 This PS4 headset is the basic model from Sony, and it comes in a classic black that matches the rest of your tech and consoles. Unlike some other headsets, this one is only compatible with the PS4. There is one earmuff that sits comfortably over the ear, with soft padding to ensure that you can wear it for prolonged periods. The other side is a plastic strip that is placed on the side of the head. The microphone can be pulled down or pushed up according to when you want to use it, and the sound quality from it is pretty good for those listening on the other side. There are controls on the wire, so you can access everything quickly and easily, including muting the mic. Plus, plugging it in is really easy as well, as you just need to slide it into the PS4 controller and it’s ready to go. Some customers have found that they can be a little uncomfortable to wear at times due to the lack of padding on the headband. This PS4 headset comes at a really low price, and one that really can be afforded by anyone who is in need of one. While there is no padding on the headband, which can make it a little uncomfortable, it is tolerable, so they won’t leave you tearing them off your head in agony. Plus, the sound quality is great for the price, and they plug in really easily so that you can get started. The controls are accessible, and it does everything you need it to for a truly excellent gaming experience. Everyone knows Turtle Beach, they are the masters of the gaming world, and they produce some of the best gaming headsets on the market. 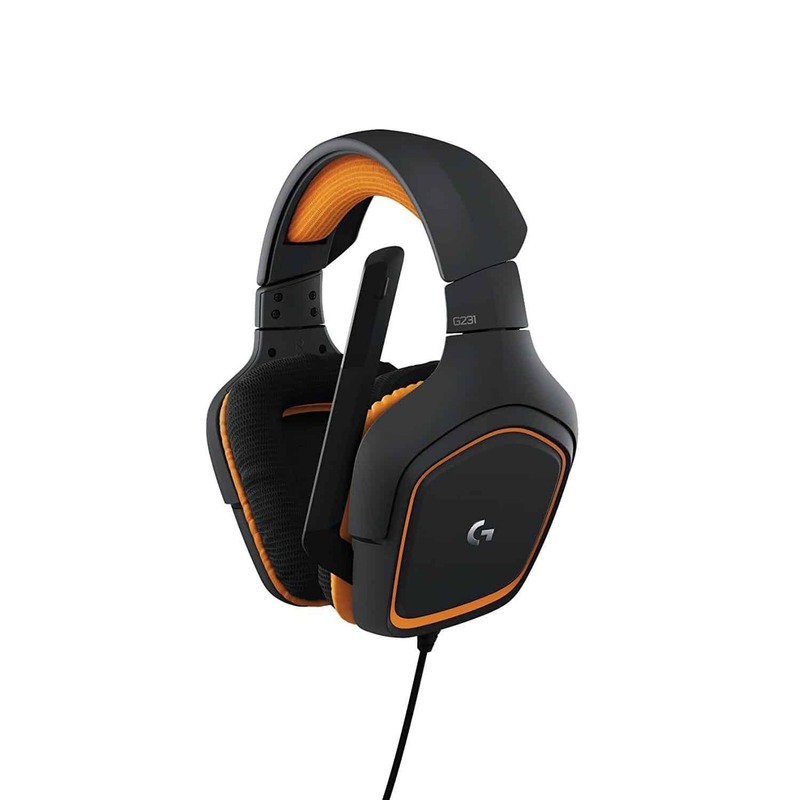 For a good quality wired headset that comes at a budget price, this could be the one for you. All you need to do is check out the reviews below and see. 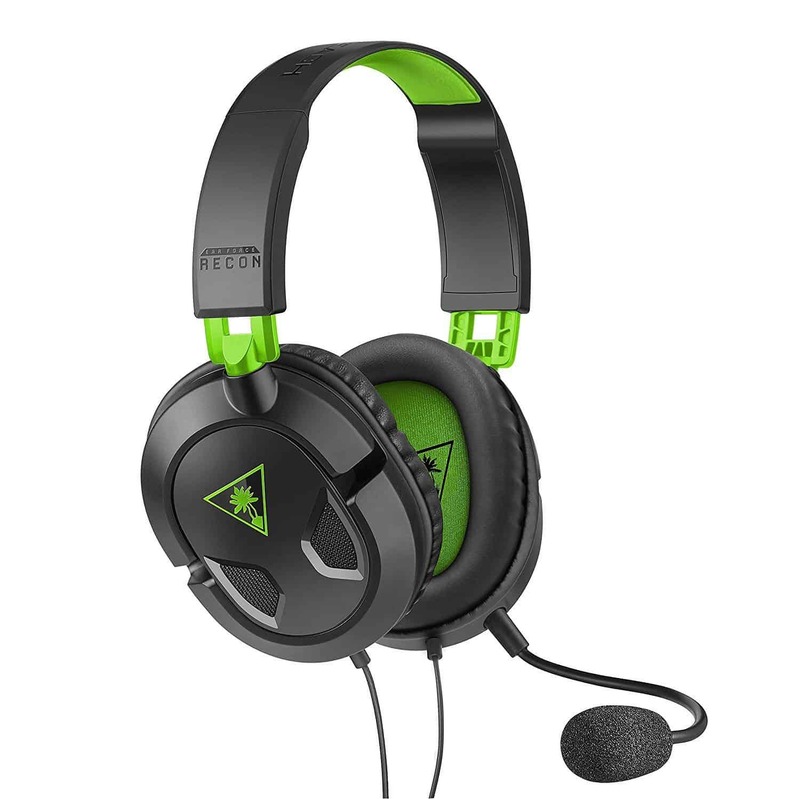 This PS4 headset comes in black with green detailing, the classic colour combination, but you can also pick it up in white if you fancy a change (or have a white console). They are really versatile as well, so they work across all platforms, including Xbox and PC, so you can use them for everything. They are also night and lightweight, which means they will not weight your head down while you play. The 40mm speakers are amazing quality, bringing the game to life around you and allowing for complete immersion. The mic is retractable, and allows for clear speech, with vocals coming in on your end being equally crisp. They are very comfortable, with over ear muffs and a padded headband so that you can keep going for hours. Plus, they just plug into the controller, so you are ready to go. Some customers felt that it can be a little bulky to wear. This PS4 headset comes at a great price, and one that most people can afford relatively comfortably. While there are some who feel that it is a little bulky, it isn’t a fashion item, and the level of comfort you receive is well worth any bulk. It is compatible across all platforms, with controls that are easy to access, and a retractable mic, there isn’t much more you need, and it all comes at a price that will leave you feeling like you got a great deal. Here are some further models of PS4 headset, just in case the ones above do not quite meet your requirements. This PS4 headset comes from top brand Logitech, who is known for manufacturing some of the best gaming equipment around for your enjoyment. This particular model comes in black and orange, alongside a long cord and retractable mic. The ear pads are exceedingly comfortable, caressing your ears to prevent aches and pains are long periods of use. The sound quality is fantastic, with crisp vocals and clear background music that will leave you fully immersed in the video game world. Despite all of this, it remains lightweight and perfectly balanced for the best possible experience while playing your favourite games. There are even controls on the cables, making adjustments that much easier for you, and all of this comes at a very low price. Another top brand, this is one that works hard to meet all of your needs while gaming, either alone or with friends. The over-ear design leaves a comfortable feeling across your entire head, from the padded ears to the padded headband, every aspect of this model has been designed with you in mind and to withstand a good few hours of solid gaming. They are also breathable so that your ears don’t sweat, and they come with a long wire to plug in, so you don’t have to be too close to the TV. The sound is clear and natural, with a retractable mic that delivers equally crisp volume to those you are talking to (or yelling at) while you play CoD. There are also controls on the actual headset to make things easier for you, and it comes at a very modest price. Hopefully, this guide has helped you to find the best PS4 headset under £50, and it has given you some guidance when figuring out which ones are going to really bring your video games to life, but also allow you to talk with your friends. We know how important it is to be able to communicate and really get yourself into the game, but we also understand that not everyone has the cash for the latest headsets, and sometimes we have to stick to a budget. Cheap doesn’t mean bad though, as demonstrated by the excellent models that we have listed here – each of which come from well-known and trusted brands. 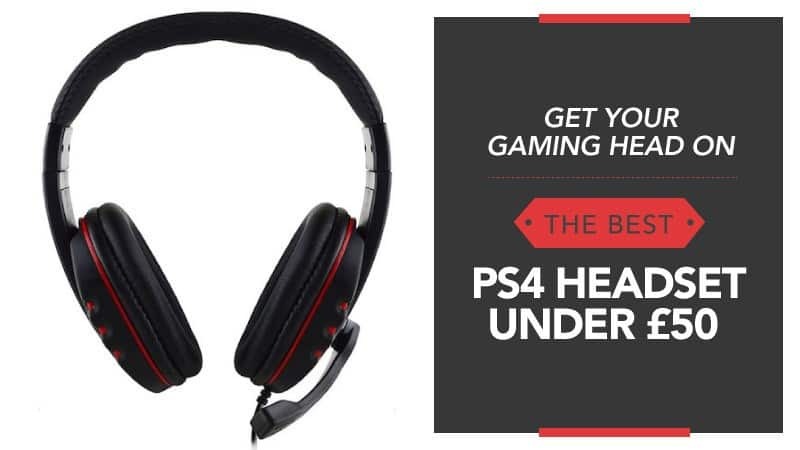 Whether you want something official from Sony or are a Turtle Beach lover, there is a headset here that is going to hook you up perfectly, and your game is going to be better than ever before. What did you think of our PS4 headset guide? Are there any that you would have liked to see or recommended? We love hearing from you, so make sure to leave us a message in the comments below.